If there are business commandments, “Know thy customer” is undoubtedly one of them. If you don’t know about your leads and customers, you won’t be able to pitch your services right — hampering success. Big or Small, every business knows this, but it is worth mentioning again: You need to know your customers. How do you get to know your customers? Talk to them of course. As you learn things like their budget, their needs, and things such as whether or not they have kids, and where they live what do they do and If you’re like most small businesses you started off just remembering these facts in your head. But, your business grew, and you’ve gained the trust of more customers, and now you’ve got a team of people outgrowing your ability to remember all these facts. Once you got here, you probably started jotting notes down for each client, but as you built a history with them, the information you have is inconsistent, hard to search and very difficult to zoom out and see the big picture. You’ve outgrown notes too. So, now what? I am going to show you a way that you can collect information about your clients that your entire team can use so they can get the same type of information about all your customers, find what they need immediately, and quickly use your client information to gain new insights about your business. Intake questionnaires are a time-tested tool for businesses that capture information about customers and leads. They help by consistently asking the same questions and storing the answers for you. This way you can make sure you’re winning more by offering only the services a lead needs, on a budget, and pitch it in a more meaninful way. If you can’t help someone, you can quickly identify that and move on to new business. As you build a more extensive library of questionnaires, you can increase the effectiveness of your marketing and lead generation because you can analyze them and learn more empirically. How you perform an intake form will vary depending on your business, preferred style, and its purpose. If you’re in real estate, you may want to do an in-person interview where you ask various questions, conversationally, so you can stay focused on providing a comfortable service while you match them with their dream house. A lawyer may want to have a legal aid sit down and formally go through each item to ensure the accuracy completeness of the questionnaire, so you’re not caught off guard by new information and compliant with the law. If your website is the way you generate leads, include a web form that a client fills in before they request your services. The types of questions will also vary, but it is important to consider what details you want to capture. You’ll probably know some of the basic questions you’d want to ask for each client, but you should also ask more detailed questions that tell you more about their buying preferences as well as their demographics These questions will help you find new opportunities and make decisions down. How often do they need this service, etc. These are the things you need to know to provide quotes, quality services and help define your niche. You can use paper intake questionnaires, but this gets messy quickly and makes gaining new insights difficult. To get more out of your intake questionnaires, and win more business check out Daylite forms. Daylite forms give you all the benefits of an intake questionnaire and add the power of linking as well as includes a powerful filtering engine. 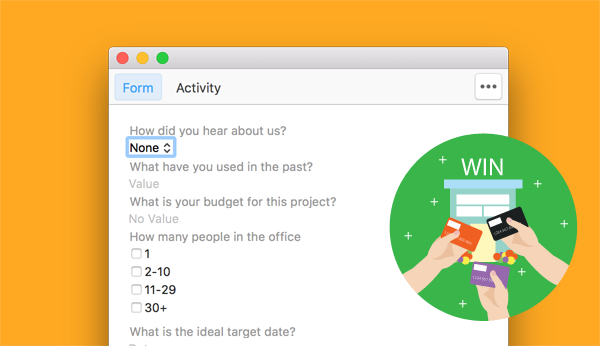 With Daylite, you quickly find forms when you want to review a client, as well as dig deep and see trends. It can even do you one better. With Filters and Smart Lists, you can match new opportunities to your customers and can take the offense instead of waiting of for sales. If you’re interested in starting an intake questionnaire for your business or want to take yours to the next level, check out this video and see on creating forms in Daylite and start winning more business.